A host of newly-discovered wasp species have been given unique names, including being dedications to Oreo biscuits and aliens from Doctor Who. One species has been dubbed ‘Sathon oreo’ and another ‘Choeras zygon’ after the Zygon race of aliens in the popular programme. These wasps inject their eggs into live caterpillars, and the baby wasps slowly eat the caterpillar from the inside out – a similar trait to the fictitious aliens. 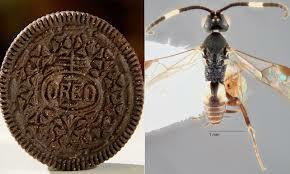 Dr Erinn Fagan-Jeffries, from the University of Adelaide’s School of Biological Sciences, said: ‘I named one wasp Sathon oreo as the antennae are dark brown with a thick white stripe in the middle… like an Oreo chocolate biscuit. The wasps are pivotal in ecosystems for regulating native caterpillar populations.